Meet the recently rebranded Ben Lambeer. The problem with the last name “Lamb” is it’s tough to sound like a badass stone-cold killer with it. It’s probably why Bill Laimbeer put “beer” at the end of his name. Bill Lamb (or Laim, whatever) doesn’t strike fear and ire in the hearts of men. Bill Laimbeer though instantly turned into the toughest white guy in the NBA. 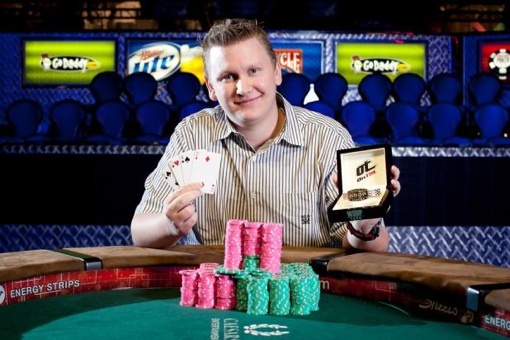 So given how much Ben Lamb is epicly crushing and pwning this year’s WSOP (it’s so so sick, one time! 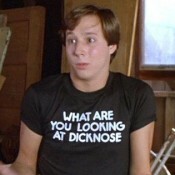 ), we will refer to him as Ben LambeerTM from this stage forward. :: Event #42 ($10,000 PLO) – Four players returned, and, just a week after runner-upping the $3k PLO event, Ben Lambeer emerged as the winner, banking $814,436. The win moved Lambeer (see what a difference that makes?) to first in the 2011 WSOP Player of the Year rankings, a good 65 points ahead of Phil Hellmuth. 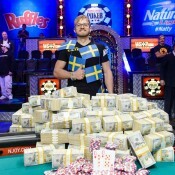 Lambeer defeated Sami “LarsLuzak” Kelopuro ($503,173) heads-up for the title. Get full results here. :: Event #43 ($1,500 NLH) – This event is like Rasputin. It just won’t go away. Down to heads-up, Nachman Berlin has a 3-to-1-ish chip advantage over Andre Akkari. :: Event #44 ($2,500 Razz!) – The super-fun Razz! event is also down to heads-up play, with Stephen Su (1,655,000) ahead of Rep Porter (1,080,000). See who pulls out the Razz! title later today. :: Event #45 ($1,000 NLH) – All eyes were on Phil Hellmuth, as he made yet another deep run in another event, ultimately bowing out in 28th place ($10,560). A total of 21 return today, with Canuck Jonathan Driscoll as big stack with 1,247,000. He’s followed by Kenneth Griffin (1,133,000). Antonio Esfandiari is fourth overall (663,000). Get full chip counts here. :: Event #46 ($10,000 NLH Six-Handed) – Well, this event was a success. 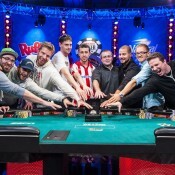 A total of 474 entered the $10k Six-Max, creating a first place prize of $1,158,481 (the WSOP’s first $1M+ prize of the year). Recent WPT winner Alan Sternberg ended as chip leader, stacked at 260,600. He’s followed by Kevin Saul with 242,600. And in third overall is Ben Lambeer with 223,000. Keeping up with the big name big stacks, in fourth through seventh are Joe Cada (208,800), Mike Sowers (203,900), Jake Cody (198,900), and McLean Karr (196,800). For all of you Bjorn Verbakel fans out there, he’s got 143,000. Get full chip counts here. :: Event #47 ($2,500 Omaha/7Cs 8oB) – The final event of the day brought in 450 players, creating a first place prize of $255,959. With 201 surviving to Day 2, Abe Mosseri is chip leader, stacked at 64,200. He’s followed by Kevin Iacofano with 47,200. Get full chip counts here.